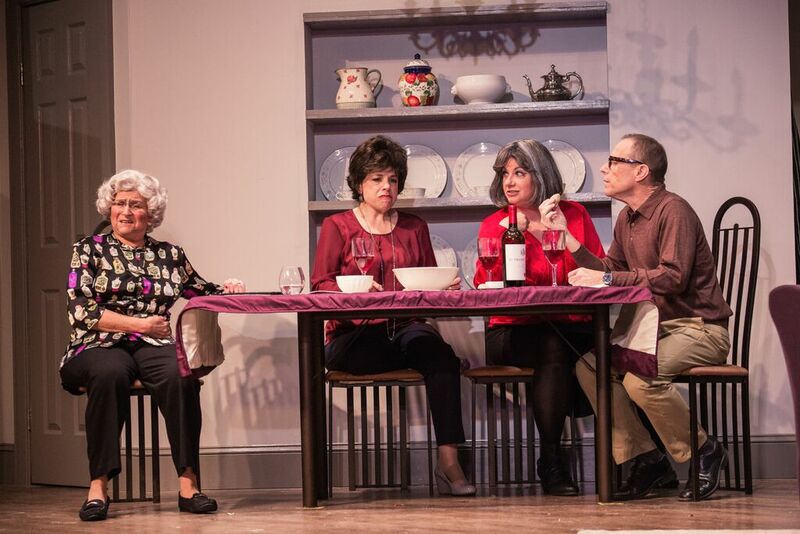 Janice Zucker (Frieda), Karen Jadlos Shotts (Marjorie), Marianne Meyers (Lee), and Jack Stein (Ira) photo by Misty Angel Photography. It isn’t often that we are able to give our friends at The Little Theater some editorial space since our publication dates rarely jive with their shows performance runs. This month, however we had the pleasure of being able to give a real “thumbs up” to the current production, The Tale of the Allergist’s Wife. The show is based on Marjorie Taub, a middle-aged Upper West Side doctor’s wife, who is devoted to mornings at the Whitney, afternoons at the Museum of Modern Art and evenings at the Brooklyn Academy of Music and is plunged into a mid-life crisis of Medea-like proportions. She is shaken out of her lethargy by the reappearance of a fascinating and somewhat mysterious childhood friend. Filled with passion and humor, the New York Times called The Tale of the Allergist’s Wife “a window-rattling comedy of mid-life malaise”. In order to fully appreciate this production, one has to have a good sense of both New York and Jewish humor. Every member of the cast has the accent and dialect down pat. There isn’t a weak member in this cast. Marjorie is played by Karen Jadlos Shotts, her husband Ira by Jack Stein, her mother Frieda by Janice Zucker, friend Lee by Marianne Meyers and doorman Mohammad by Omar Rocha. The performance went off without a flaw. I would be remiss if I didn’t comment on the set design. Once again, LTA has hit a home run. It actually feels like you are in the Taub’s apartment. Even the detail in the galley kitchen makes you feel like they are actually cooking in it. This is a production not to be missed.